TEST SECRECY AND ANOTHER CPS RACIST COVERUP... '...The language used by the authors may be offensive to students...' CPS blames CPS 'teachers' for racist (but SECRET) 7th grade REACH material causing a student and teacher uproar! One thing about secret tests, whether it was the CASE tests under Paul G. Vallas and Arne Duncan 15 years ago or the latest REACH materials today -- a secret test makes it nearly impossible to critique the test itself. Without going into great historical detail, it's why I published six of the 21 CASE tests in the January 1999 Substance, got sued for a million dollars by Paul Vallas (for "copyright infringement") and was ultimately fired by CPS (for "copyright infringement", a first and only in history). The tests I published had been administered to more than 90,000 Chicago high school students by then and the testing program was over for the semester when Substance received those tests and I made the decision to publish several of them in their entirety. Why? Because cherry picking individual "items" was not going to allow for a public debate about the entire tests, which were uniformly bad. 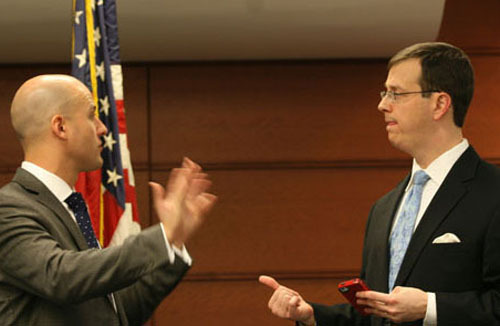 Like most of the top administrative officers put into power in the nation's third largest school system since May 2011 when Rahm Emanuel appointed his Board of Education in Chicago, Jack Elsey (left) and John Barker (right) have no Chicago teaching or administrative experience. Elsey was imported from Michigan; Barker from Tennessee. Jack Elsey is the CPS "Chief Officer for Innovation and Incubation" (a job title that does not yet exist in any other American school system) and Barker is the "Chief Accountability Officer". Substance photo by David Vance.That was 1999. Now it's 2014 and we are still shadow boxing because test "content" is a TOP SECRET. TOP SECRET TESTS means parents, students, teachers and the general public are forbidden to discuss content in public. And so, on May 9, 2014, dozens of teachers and students across Chicago became incensed about racist content in a CPS test -- but were not allowed to cite the racist content that prompted their anger. And a CPS test administrator was able to explain, without allowing a discussion of the actual problem, that it wasn't really a problem, and if it really was a problem, the problem was with the (anonymously SECRET) "teachers" who allegedly had written the offensive question(s). That was ridiculous then in 1999 when Paul G. Vallas was "Chief Executive Officer" of Chicago Public Schools and signed his name to the infamous CASE tests. Such test SECRECY remains ridiculous today, in 2014, when Vallas's current successor as the corporate-style "Chief Executive Officer" of America's third largest school system is an Ohioan named Barbara Byrd Bennett (who followed Jean-Claude Brizard; who followed Terry Mazany who followed Ron Huberman; who followed Arne Duncan as "CEO" of CPS). One of the things all of them have in common is their worship if TEST SECRECY. And it was in support of TEST SECRECY (under the guise of "copyright infringement") in 2002 and 2003 that Judge Richard Posner, one of the most infamous reactionaries among America's "public intellectuals" penned a 19-page judicial decision (on behalf of the Seventh US. Circuit Court of Appeal) that stripped me of my First Amendment rights to critique the content of SECRET TESTS (and in the process turned me into an adjective, just to be clever). That question was one of dozens that was allowed to be kept SECRET by the federal courts back in 1999. Now, in May 2014, we are still facing the same ridiculous problem as students and teachers fume about another example of racism in Chicago testing -- BUT CAN'T TALK ABOUT THE TEST QUESTIONS THEMSELVES! I'm writing to respond to concerns that have been raised about the texts used in the 7th grade EOY Reach Performance Task. Any librarian who administered to 7th grade in BOY is included in this email. The EOY task asks for students to evaluate the authority of two authors, who both take anti-immigration/immigration reform stances. Students then have to explain the author's comments and provide details from the author's text. The language used by the authors may be offensive to students. Please note, this task was created by CPS librarians in the Spring of 2013, at the same time as the BOY task that contained pro-immigration viewpoints. In designing these tasks, the intent was to present 2 sides to an issue, but maintain the focus on evaluating the credentials of an author. We realize though that the BOY task was presented 8 months ago and students may not remember the pro-immigration texts. As a result, please find attached an alternate EOY Performance Task that you can administer instead. Also attached are the teacher directions and rubric for the alternate. Note: the structure of the task and standards measured are not changed, just the content of the text. In addition, find attached an Addendum that further explains this and also provides language you can use if you choose to administer the original EOY task. Thanks for your hard work everyday. Feel free to reach out to Lisa Perez (Libraries Manager), Peter Leonard (REACH PT Manager) or myself if you have questions.